One glance is all it takes to see how different this website is from its predecessors, but it’s designed to provide easier access to the several hundred pages of content you will find here. This tutorial will show you how to navigate from one area to another with ease. First the home page, which is also referred to as The Bridge. It’s a side-scroller that gives you the simplest overview of the entire site. The first window tells you what’s been posted in the newest update and when you can expect to see the next one. If you’re only looking for the latest additions, you don’t need to go any farther. It also contains instant access to the links page, which gets new entries with every update. 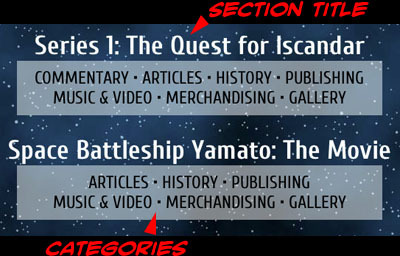 The second and third windows comprise the Classic Saga Archive with a section devoted to each part of the original Space Battleship Yamato saga. Click on a section title to jump to the section page, or if you already know which category you want to browse, click on that instead. The fourth window contains the Research Archive, which consists of four sections. The Production Years and The Legacy Years both cover broad topics that go beyond individual Yamato productions, and they are divided by time frame. The World of Star Blazers is devoted entirely to the English-language version of the show. Essays and Interviews is a collection of material on individual members of the production staff. The last window is the Special Archive. The Modern Saga is where you’ll find coverage of Yamato productions from 2009 to present. The Yamatour Travelogues section contains records of Yamato-related trips to Japan with all sorts of adventures and surprises. Galleries and Fanfic Comics are exactly what they sound like, and the Community section will connect you up with other fans. If you click on a section title from the bridge, you’ll be taken to a section page like the one shown above left (for Series 1). Each section page contains links to its categories. Whether you click on a category here or from the Bridge, it will take you to the same place, with a list of all the articles in that category (above right). Whenever new articles are added to the site, they will appear within their designated category. Some articles fit into more than one category, so you may see them in multiple locations. 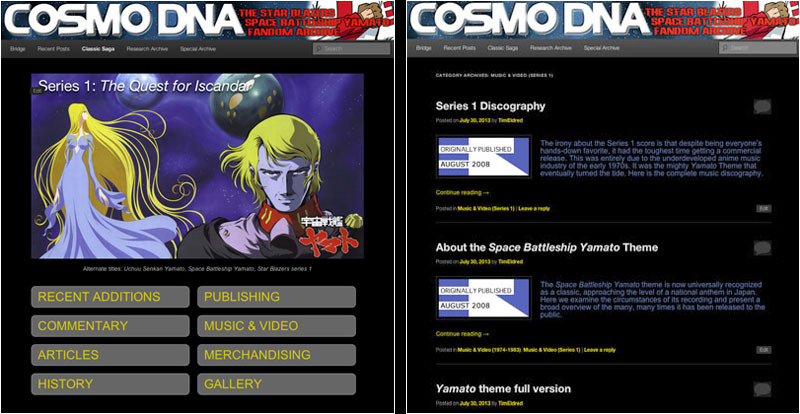 Even if you’re only looking for one article, it’s always worth your time to browse a category or click on related links within an article since the complex world of Yamato is interconnected on multiple levels — exactly like this website. Every page you go to on the site will have the same banner at the top, which includes a navigation bar. This bar will allow you to jump around the site at will without returning to the bridge. Mouse-over an item in the navigation bar to open a dropdown menu. Above left you see the dropdown menu for Classic Saga and above right is the one for Research Archive. The sections match what you saw on the Bridge, and will take you to a section page. Above left you see the dropdown menu for the Special Archive, which has additional options attached to it. Above right you see the options for the Modern Saga section, which take you directly to a category list. Above left you see the options for Galleries and Fanfic Comics, and above right are the options for the Community section. Again, all of these dropdown menus can be accessed from any page of the site. With a little practice, you’ll be warping from place to place like an expert navigator. If you’re feeling adventurous, there’s one more way to get around. In the URL on top of every page you’ll see the word “vault” followed by the designation for the page you’re on. Type over that with a random number (1 to whatever; as of August 2013 the page numbers go up to 784) and see where it takes you. You might find something you never imagined. Lastly, at the end of every page you’ll see space for comments (like the one below). This is a WordPress site, so it’s quite a spam magnet. We do our best to keep the spam out of your way, but if you see some just keep scrolling. We welcome any and all comments, and if you happen to find a mistake or a problem with a page, please let us know so it can be corrected. We’ve done our best to make Cosmo DNA easy to explore, but if you have suggestions that would improve the experience, just type some words about it below. Now quit reading this and head off to outer space! It’s a lot more fun there!